The five circles on the ceiling originally were drawn in 2008 by Chicago artist Larry Cope. In the center, the large “IHS” is a 15th century logo representing the Holy Name of Jesus and popularized by St. Bernardine of Siena. It is placed over a shadow-image of a phoenix bird, the mythical figure rising from its own ashes, Christ rising from the dead, Chicago rising from the Great Fire, and the Cathedral itself surviving with a new life. The surrounding circles are the classic representation of the four evangelists – Matthew, a Man; Mark, a Lion; Luke, an Ox; John, an Eagle. The gold leaf on the ceiling was meticulously restored in the wake of the 2009 fire by Daprato Rigali Studios of Chicago. Perhaps the most striking feature of the Cathedral is the Resurrection Crucifix, created by artist Ivo Demetz, which is a powerful interpretation of the universal sign of Christianity. Suspended above the main altar, the wooden Crucifix depicts Christ as he is today and always, not a figure in agony, but the risen and triumphant Lord who died for our salvation. The Stations of the Cross start along the north aisle of the Cathedral, circle the back wall the move up the south aisle. Depicting the Passion, Crucifixion and Resurrection of Christ, the stations are cast in bronze and framed in red Rocco Alicante marble. They are the works of Goffredo Verginelli. Moving east into the Cathedral, you approach the sanctuary and the main altar. To the left is the Ambo (lectern) of the Evangelists, where the Word of God is proclaimed during Mass. This bronze casting by Eugenio de Courten depicts the authors of the Gospels with their symbols: Matthew, the angel representing the Gospel of the Church; Mark, the lion and inspiration for Peter’s teachings or catechesis; Luke, the ox, for his recounting of Christ’s infancy; John, the eagle, for the writer of the Spiritual Gospel, recounting the story of “the Word made flesh. A six-ton monolithic block of red-black Rosso Imperiale di Solberga granite from Argentina forms the mensa or table top of the altar. The pedestal is encircled by a bronze bas-relief depicting Old Testament scenes of sacrificial offerings and preparation. These precursors of Christ’s sacrifice are Abel’s offering of the first sacrifice; the priest Melchizedek giving bread and wine; (pictured) Abraham’s willingness to sacrifice his son Isaac; and the Prophet Elijah receiving bread and water from the Angel of the Lord for strength to continue on his journey. The consecrated altar contains relics from St. John the Apostle and St. Timothy. This striking bronze screen represents the Ascension of the Risen Christ. In the Northeast corner of the sanctuary is the Cathedra, the Bishop’s chair, the genesis of the word “Cathedral.” This simple carved chair features three panels depicting our first Christian teachers, Christ (center) and Saint Peter (left) and Saint Paul (right). On the rear wall of the Cathedral Sanctuary are five bronze panels representing the Holy Name of Jesus, designed by Attilio Selva. From the left: Simeon contemplating the Infant Savior, whom Mary presents in the Temple; the divine origin of the name, depicting the Mystery of the Trinity and an angel carrying the monogram of Christ to earth; the Risen Christ proclaimed as Lord; the Presentation of Jesus in the Temple, showing Mary and Joseph presenting the Child for circumcision and naming (click the image, below, for a more detailed view) . On the right, the Holy Name and Priesthood of Jesus, with Christ adorned in vestments presenting the chalice to all people. Immediately above the sanctuary panels, you can see five red, broad-brimmed, ornamental hats suspended from the ceiling. Traditionally, this symbol of a Cardinal is raised to the ceiling of his cathedral upon his death. The hat hangs until it turns into dust, a reminder that all earthly glory is passing. The center hat belonged to Chicago’s first Cardinal, George Mundelein. From left to right, the galeros represent Chicago’s late Cardinals Meyer, Bernardin, Mundelein, Cody, Stritch and George. With Vatican II, the Pope discontinued the practice of presenting a galero to newly installed Cardinals. The tradition continued, however, and hats were made for Chicago’s post-Vatican II Cardinals, Cody, Bernardin and George. Handmade by Casavant Frères in 1981, the sanctuary organ is comprised of 1284 pipes in 19 stops distributed over 2 keyboards and a pedal. It is a modern adaptation of organ building in the 17th-Century French style, one of the most distinguished periods in organ history. 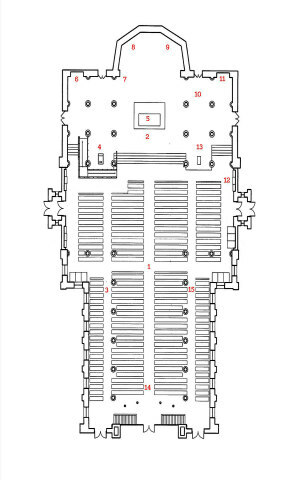 The Shrine of the Blessed Mother is located to the right of the main altar and the sanctuary organ. The bronze casting of Mary’s Assumpion into heaven rises over Rosso Alicante marble. These oils, consecrated each year at the Chrism Mass, are used in Catholic sacraments: Oil of Catechumens at Baptism; Oil of Chrism at Baptism, Confirmation and Holy Orders; Oil of the Anointing of the Sick to minister to those who are ill.
To the right of the sanctuary is the Ambo (lectern) of the Epistle Writers, also the work of the de Courten. Used by lectors and cantors during the Sunday Mass and special liturgies, this Ambo depicts the authors of the Apostolic letters to the early Church communities: Peter, with keys to the Kingdom of God; Paul, who died by the sword; James, representing faith sustained by good works; and Jude, carrying a whip representing correction. This magnificent instrument, with its vocality of tone and soaring beauty of its French Oak cases, is one of the most significant organs in the United States. It was handmade for the Cathedral in the workshops of Flentrop Orgelbouw in Zaandam, Holland, and installed in 1989. Comprised of 5,558 pipes in 71 stops over 4 keyboards and pedal, it is easily the largest mechanical action organ in the Chicago area. Its true grandeur, however, does not come from its size or appearance but from its wide spectrum of available sounds, which gracefully lead musical liturgy and lift the hearts of all who hear it. For more details about this instrument click here. The abstract stained glass windows, created in Milan, were designed to create an atmosphere of prayer and reflection, while making maximum use of light. Like every piece of art in the Cathedral, they tell a story -of humankind’s movement from darkness into light, from sin into salvation. Dark blues and reds dominate the western windows, with the colors gradually progressing to the whites and golds seen behind the altar and the Resurrection Crucifix. Holy Name Cathedral represents the integration of Gothic design with the message of the modern Church to the People of God. Each element tells a story of salvation; together, they make a powerful statement about the relationship of God and the People. The church building is 233 feet long, 126 feet wide and can seat 1,110 people. The ceiling is 70 feet high; the Cathedral spire reaches 210 feet into the sky. You’re sure to find something to inspire during your visit to Holy Name Cathedral…the place where Chicago goes to pray. Discover this Chicago landmark building’s rich history and bask in its beauty and architecture.